“They” say nothing good ever happens after 2am. “They” have obviously never had frozen cocktails and fried chicken after 2am. 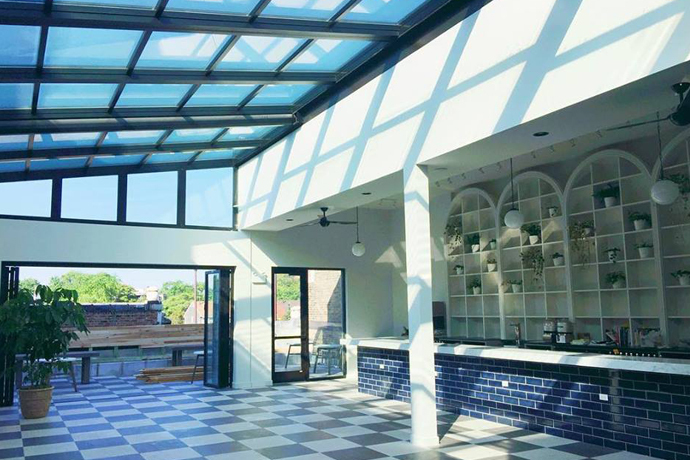 “They” should meet Tippling Hall, a new late-night cocktailing salon from the gentlefolk of Mercadito, now open in River North. 4pm: Appreciate the thoughtful decor like metal hip flasks hanging from the ceiling (see the slideshow here) while you eat duck empanadas and steak frites (see the menu here). Your drink: Wine. They’ll bring the bottle and measure what you drink—a reasonable $1.25 per half inch. No, really. 5 to 8pm: Post-work marauders with loosened ties consume beer cheese fondue with gleeful abandon. Your drink: Sunny Side, a bourbon cocktail finished with moonshine bitters. 8pm to midnight: Giant beer steins are being hoisted. Chili-infused, frozen bourbon cocktails are being poured. Just order some fried chicken and hold on. Your drink: The Derek Smalls, a bison-grass-vodka cocktail poured from a Spinal Tap handle. Insert “this cocktail goes to 11” joke here. Midnight to 2am: Double Fisters—cocktails that require both hands—are happening. 3am: You could benefit from a last-chance croque-monsieur right now. Your drink: The Ronzio: grappa-spiked coffee. 4am: Nothing good happens after 4am.